October 3 2015. As of today there are 202 Elite Masters Athletes entered for the USATF 5K Masters Championships at the Syracuse Festival of Races this coming Sunday. Once again the race will be attracting the highest number of entrants on the USATF Masters Racing Circuit. It is a tribute to the wonderful job that Dave Oja and his staff do in welcoming and valuing the Masters athletes and their accomplishments. Some of the athletes come because they are challenging for the podium, others because they are valuable members of a team and still others because they are good athletes and value the camaraderie at this gathering. As a result there are tremendous races, both overall and in the age groups, lined up for our collective pleasure. The weather appears to be cooperating. As of this afternoon the forecast for today just includes the chance of a few sprinkles and for race time tomorrow it should be upper 40's and overcast with no rain. Women. Last year's event was highlighted by a Jennifer Rhines attempt on Colleen DeReuck's 5K Masters record. Though Rhines is not back, we have an extremely tight contest with a number of close contenders. Four names need to be mentioned as vying for the top spot. Cassandra Henkiel (Austin TX), winner of the USATF 8K Championship at Brea CA in February in 29:17 is probably the favorite. But she divides her time between the roads and the trails and does not race as often as some. The most recent 5K I can find for her is the 2013 Carlsbad 5000 where she ran 17:52. There are others in the field who can match that. 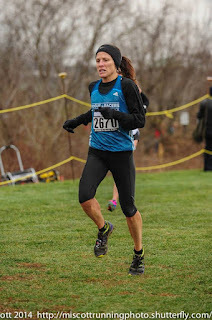 Renee Tolan (Clifton Park NY) has run four local 5K races this year ranging from a 17:35 to a 17:58. Perhaps even more surprising is that the reigning Queen of the women's 50-54 division, Marisa Sutera Strange, is definitely a threat to take her second overall title in the 2015 USATF Masters Racing Circuit. Men. The 2014 champion, Greg Mitchell (McMinnville OR), is back to defend his crown. And most of the guys who were chasing after him last year are back, with a few new challengers. Mitchell took first place in 15:03 last year. This year he has already finished 2nd at the USATF Cross Country Championship and won the USATF 8K in February and took first at the 1 Mile Road Championships in late August in 4:29. He also took the Bowerman AC 5K in mid-August in 14:59. So Mitchell appears ready to roar. Unless his fitness has faltered in the last month and a half he seems primed to repeat. But the rest of the podium appears up for grabs. Chad Newton (Pisgah Forest NC), 2nd last year in 15:40 is back along with his Atlanta Track Club teammate, Kristian Blaich (Decatur GA) who ran 15:50. They should be the favorites to fill out the podium but nothing is ever a sure thing. Newton ran well at the USATF Outdoor Track and Field Championships, winning his age group in the 1500 meter run and the 5000 meter run in 4:18and 16:11 respectively. should come in under 16. Two other runners who should not be overlooked include Christian Blondin (Ipswich MA) and Philippe Rolly (McLean VA). Blondin trailed Mitchell by 14 seconds in the USATF 1 mile championship at the CRIM Mile in finishing 7th overall. As Blondin's strength seems to be at the shorter distances, it appears he cannot challenge for the win but if he can hang with the chase pack, he cannot be counted out. Rolly ran a 16:05 at local 5K in July and was the 2nd Masters finisher last fall at the .US National Masters 12K Championships in 39:14 so is right where he needs to be if anyone up front falters. Age 40-44. It appears that Michelle LaFleur, Jennifer St. Jean and Renee Tolan should battle for the win in this age group even if they are not able to take the overall crown from Henkiel and Strange. Are there any other medal challengers? Two other runners will be contesting for the podium and, should any of the leaders falter, be right there. Karen Simmonds-Brady (Auburn NY) who ran an 18:16 5K race this summer is competitive. Heather Webster (Honeoye Falls NY) who ran a local 5K in 18:33 in August and an 18:54 three weeks ago could also factor into the race medals. With St. Jean a late scratch, I will go with: LaFleur, Tolan, and Simmonds-Brady. Age 45-49. Cassandra Henkiel should easily take the age group crown. It appears that Laurie Wharton (Marietta GA) may have the edge for 2nd place. She ran a 21:14 5k and three sub 42 10K's, including a 41:31 at the Peachtree. Audra Naujokas-Knapp (Rochester NY) may have something to say about that as she ran a 21:02 local 5K earlier this year. But her 44:26 10K at the USATF Championships does not quite match up to Wharton;'s times. But she may have a bit more speed than Wharton. The race will tell. Should either of those favorites falter, Susan Welch (Atlanta GA) has a 22:28 and a 23:12 5K on her resume this year so is ready to run. Heard a rumor that Emily Bryans (Schenectady NY) might be a late entrant. If so, this sub-19 minute 5K runner will spice up this age group and be a strong favorite for 2nd place. I'll go with a pick of: Henkiel, Bryans, Wharton. Age 50-54. This is Marissa Sutera Strange's race unless something unforeseen happens. Who else is in the hunt for a medal? Julie Pangburn (Malvern PA) who has three sub 21 5K's this year is the favorite for the silver medal. But Karyl Sargent (Lafayette NY) could press her. She has run a 20:32 and a 21:20 5K this year and finished 2nd in her age group in the Utica Boilermaker 15K in 1:09:11. Others in the hunt include Lorraine Jasper (Birchrunville PA) who ran a 21:27 this summer and a 20:11 in a local 5K 3 weeks ago and Kerry Monahan (River Vale NJ) with her 21:47 5K and a 1:39:04 in the NYC Half Marathon. But Mary Swan (Penn Valley PA), Carol Bischoff (Macedon NY) or Betsy Stewart (West Chester PA) could upset an apple cart or two. Last year they finished this race in 20:54, 21:04 and 21:17. My picks: Strange, Sargent, and Pangburn. Age 55-59. If she is anywhere near her normal fitness this group will go to Masters Hall of Fame runner, Carmen Ayala-Troncoso. Last year she had age group wins att he USATF 8K and 10K championships as well as at the USATF Club Cross Country Championships in December. 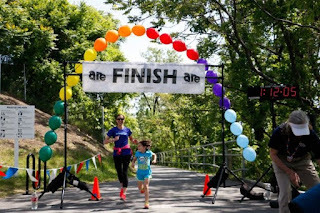 As far as I can tell, though, her only result this year is a 20 minutes flat 5K in the Freihofer's run at the end of May. So that allows room for some doubt, but she is probably fit enough for the win. No one else in the field is likely to break 22 minutes. But two of the runners should come close. Cynthia Williams (Acworth GA) had a 23:14 5K this summer and a 22:47 5K in late August. Elizabeth Besio (Camillus NY) ran a 22:58 5K this year and a 46:50 10K. Marie White (Henrietta NY) and Dianna Hinton (Waleska GA) appear to be just off that pace. Looks like: Ayala-Troncoso, Besio, and Williams. Age 60-64. The top four runners from last year are all returning.I In 2014 it was Coreen Steinbach, Sharon Moore, Cindy Ingalls, and Carolyn Smith-Hanna running 21:38, 22:41, 23:58, and 24:03 respectively. It looks like it should be Steinbach and Moore 1-2 with Ingalls and Smith-Hanna battling for the third spot. Are any of the newcomers strong enough to break up that top 4? Margaret Taylor (Atlanta GA) has run a 22:07 and a 22:35 5K over the last couple of months; that makes her the favorite to take 2nd. 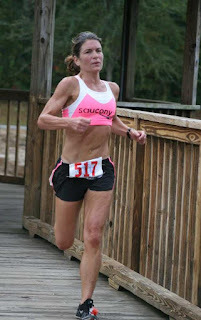 .Donna May (Miramar FL) has recent 5K times of 24:16, 24:27, and 23:48. That is very consistent and fast enough for her to give Moore a real battle for third place. Another late bulletin--it appears that Kathy Martin (Northport NY), 2013 Masters Runner of the Year will make it to the race after all. She immediately becomes the favorite. She won the group in 2013 with a time of 19:06. She was away from running for a bit this spring but has apparently recovered pretty well. Martin managed a 33:49 5-miler in early August and ran the Fifth Avenue Mile on September 13th in 5:39 so she has speed. My best guess: Martin, Steinbach, and Taylor. Age 65-69. Last year Sabra Harvey (Houston TX) broke the age group record in this race with a 20:27. That does not appear to be threatened this year. 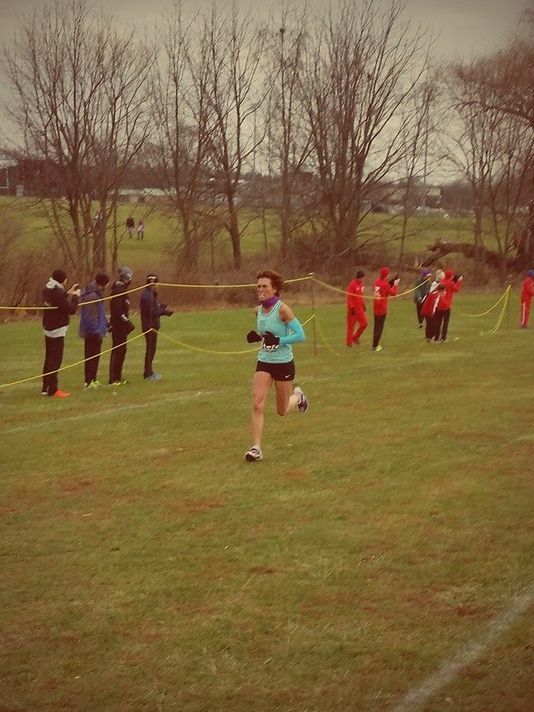 But Lynda McGuire (Scottsville NY)who finished 3rd in 25:49 is back to try for the win again. Unfortunately for her there will be some new faces at the starting line this year. Edie Stevenson (Boulder CO) is the favorite for the win; she ran a 21:37 5K this year. She finished 2nd in the 60-64 age group at the 2014 USATF 10K in 43:07 and took 2nd in her age group at the 2015 Bolder Boulder in 47:15. Erika Campbell (Ridgewood NJ) seems a safe bet for 2nd. She ran recent 23:10 and 23:08 5K's, not to mention a 6:34 at the NYRR Fifth Avenue Mile. 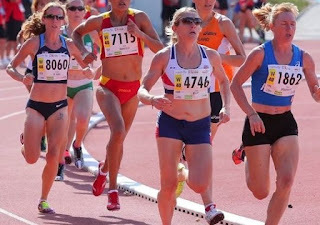 Kathleen Allen (Decatur GA) ran 25:43 on the track at the 2015 USATF Masters Outdoor Championships and should give McGuire a real fight for the third podium spot. My picks: Stevenson, Campbell, and McGuire. Age 70-74. Last year Jan Holmquist (Burlington MA) broke the record for this age group, running 22:16 and she is back to see if she can lower it a bit more. Sue Gardinier (Verona NY) who finished 3rd in 27:56 is also back and aiming for a 2nd place medal this year. Mac Mackenzie (Jamestown NY)should take 3rd. Picks: Holmquist, Gardinier, Mackenzie. Age 75-79. Last year it was Libby James (Boulder CO) and Madeline Bost (Randolph NJ) running 1-2. Bost is back but not James. Instead Estelle Hahn (Jamesville NY) and Fran Rowe (Niagara Falls NY), who both moved up from the 70-74 group will contest the medals with Bost. Bost ran 34:47 last year to Rowe's 35:38 and Hahn's 36:06. With no change in fitness, it looks like Bost, Rowe and Hahn. Age 80-84. Edna Hyer (South Wales NY) and Anny Stockman (Rensselaer NY) will renew their rivalry. Who will be the eldest age group champion on the day? Anny Stockman took the win last year and is expected to prevail this year as well. Looks like Stockman, Hyer. Age 40-44. Greg Mitchell should take this gold medal. With Newton and Blaich both in the M45 division this year, that leaves Alan Black trying to hold off Christian Blondin and Philippe Rolly for the silver. It should be a terrific contest for the 2nd and 3rd spots. My picks: Mitchell, Black, Rolly. Age 45-49. Chad Newton and Kristian Blaich should battle for 1st and 2nd with Newton having a slight edge. Who else will be in the mix? Last year Matthew Whitis (Columbus GA), their Atlanta Track Club teammate followed Blaich across the line to take 2nd in 16:17. That should be good enough for bronze this year. David Atkinson (Grand Blanc MI) will leave no room for error. Though running mostly longer races, including a 1:17:29 in the United Airlines NYC Half Marathon, he also showed some speed in a 16:50 5K this year. My picks: Newton, Blaich and Whitis, an ATC sweep! Age 50-54. 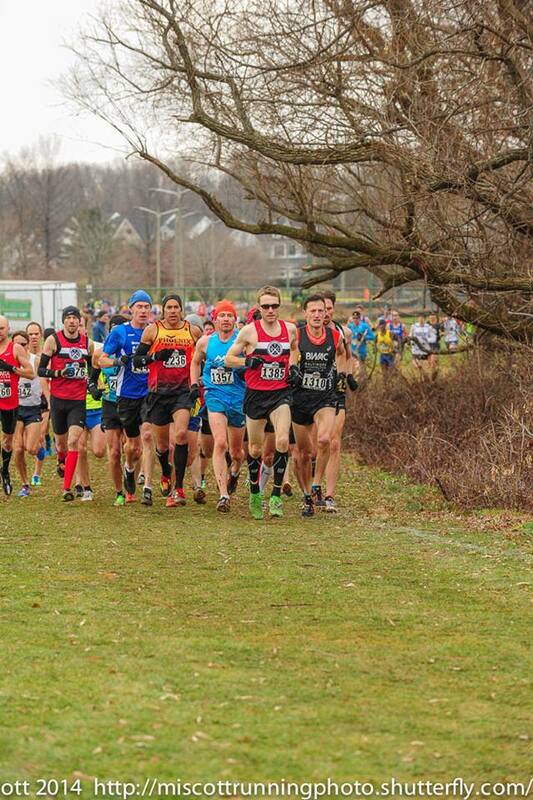 Last year saw Mark Zamek (Allentown PA), Alan Evans (Beaver Dams NY) and Ruben Henderson (Grand Rapids MI) go 1-2-3 in 16:27, 16:44, and 16:48 with Henderson's Players Elite/New Balance teammate, Daniel Dixon (Jackson MI) just off the podium in 16:59. But there is a new wave entering from the 45-49 division. The 3rd through 6th finishers in the 45-49 division last year were all 49 and enter the M50 category this year for the first time. 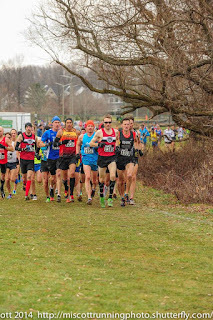 Brian Crowley (Hillsborough NJ), Mike Nier (Rochester NY), Francis Burdett (Worcester MA), and John Stadtlander (Clifton Park NY) ran 16:21, 16:41, 16:46, and 16:56 respectively. [Late bulletin: a freak ankle injury in Wales has been slow to heal so Francis Burdett has had to withdraw-Best of luck on the healing and see you next year!] So this looks like a real battle royal with 8 runners returning from last year with times ranging from 16:21 to 16:59. With no change in form it would be Crowley, Zamek, Nier, Evans, Burdett, Henderson, Dixon, and Stadtlander. Anyone completely new in the mix? Nat Larson (Amherst MA) took 3rd in a packed field at the USATF 10K championship, narrowly beating Evans and Nier in the process, and ran a 16:41 5K two weeks ago. No guaranties in life, but it looks like a Crowley, Zamek, Larson pick is as good as any and better than most. Age 60-64. As many as 30 runners could toe the line for this contest. The top end will be a bit different this year. Tom McCormack (Jonesborough TN) dominated this age group in 2014, winning by over a minute and breaking a record that had stood for 30 years. Unfortunately McCormack has had an on and off year with a variety of injuries and will not race. He will be missed in every way, not only for his speed but for his spirit, which added a lot to the group. Apart from McCormack, the top end included: Joseph Reda III (DeForest WI), Reno Stirrat (Rockaway NJ), and Terry Pirmar (Perkasie PA) in 18:19, 18:33, and 18:50. Of those three, only Stirrat appears to be entered; he had a good summer of racing, cracking an 18:00 in a 5K in August. One runner who was not here but will surely try to keep Stirrat from the gold is Tom Bernhard (Castro Valley CA) who took 3rd at the USATF 8K championships in February in 29:10, in the process besting Stirrat by a full minute. In addition to that, he has two sub-18 minute 5K's and a 37:14 10K. 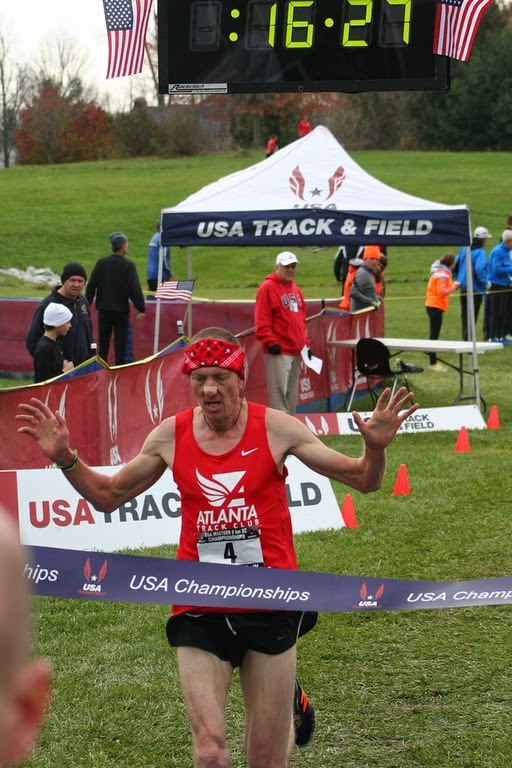 Another contender is recent inductee to the USATF Masters Hall of Fame, Doug Bell, (Greeley CO) who has run 5K's this year ranging from 17:22 to 19:10 and took 3rd in the USATF 1 Mile Road race in 5:27 should factor in as well. Others who might factor in include Peter Mullin (Houston TX) who was a terror in this age group for a few years but, after an injury, may now be looking more to competition in the M65 group. Nonetheless he has a 19:06 5K and a 42:09 10K to his credit this year. John Victoria (Colorado Springs CO) will also keep the runners up front honest as he has cracked 19 in a 5K this year. Bernhard should win it and Stirrat and Bell are likely to have a heck of a race for 2nd! My picks: Bernhard, Stirrat, and Bell. Age 65-69. 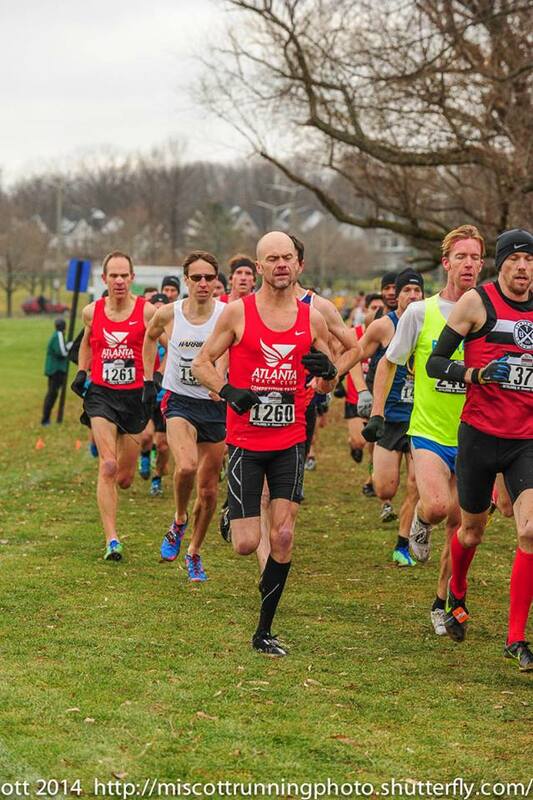 In 2014 Lloyd Hansen (Salt Lake City UT) and his Ann Arbor teammate, Terry McCluskey (Vienna OH) were joined by track specialist, Gary Patton (Rock Rapids IA) at the top of this group in 18:46, 19:22, and 19:38. Hansen is the only one of those three to return. Hansen may have difficulty dominating as he did last year; he has been slowed by an injury and an extremely hectic schedule. Although retired, he is taking on many big projects, including a major contribution to Masters Long Distance Running. Despite these barriers, Hansen has gotten his 5K back under 20 minutes with a 19:57 and a 19:33 5K recorded within the last couple of months. Who else will be up there? Bill Bosmann (Rockaway NJ) ran 19:44 last year in the M60 group, but he also ran a half marathon on September 20th in 1:33:55. Bob Giambalvo (Delhi NY) has a 19:15 5K to his credit this year. Jerry Learned (Gainesville GA) who ran with a gimpy hamstring last year appears to be back in form. He ran a 19:54 at the Hollis Fast 5K and a 43:46 at the Peachtree 10K. Another who may be in contention includes Vasan Neovakul (Atlanta GA) who ran in the Peachtree 5K this year and recorded a 19:51 in a local race on September 7th. Up until a month ago, Doc Rappole (Bemus NY) was expected to be a top contender. In February, he competed at the USA Cross Country championships, besting both Hansen and a strong west coast runner, Ignacio Jimenez (Goleta CA). But after running very well at the USATF 1 Mile Road Race in August, he ran the CRIM 10 miler the next day and apparently ran into some difficulty. He clocked a 1:20+, far slower than one would expect and his most recent 5K attempt was a 23:43 on September 6th. Looks like he is trying to come back from an injury. But there might not be quite enough time to get all the way back. Roger Price (Randolph NJ) is also on the comeback trail, with a couple of sub-22 minute 5K's but he also ran a half marathon on September 20th, finishing in 1:39:02. Paul Carlin (Indianapolis IN) is coming off a long injury year as well. He is in something of the same boat. He is improving but his most recent 5K was still a 22:23, probably too far away to be competitive. My picks: Hansen, Giambalvo, and Neovakul. 70-74. 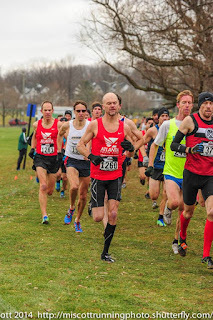 In 2014 the silver bullet from Milford MI, Doug Goodhue, was in good form, winning in 19:43. 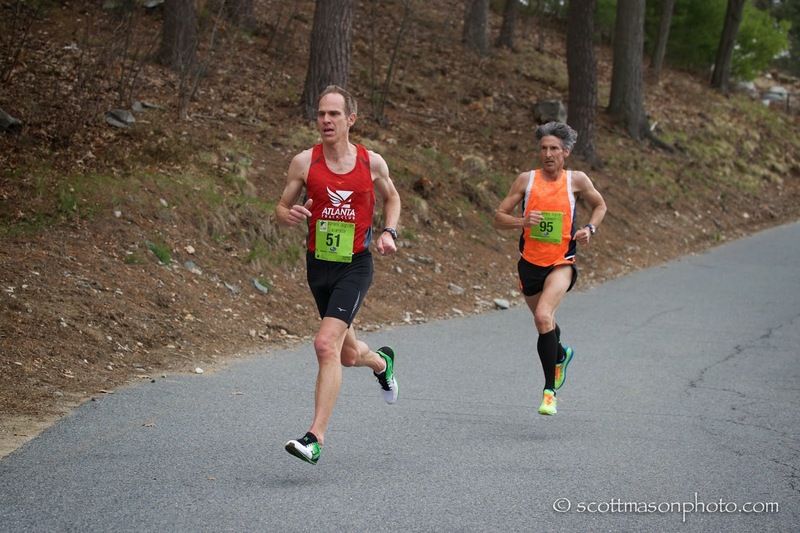 He was followed across by longtime top competitor, Jan Frisby (Grand Junction CO) in 20;22 and Milton Schumacher (North Scituate RI) in 21:05. Przemyslaw Nowicki (Holmdel NJ) was a few steps back in 4th at 21:38. All but Schumacher return. Joe Carter (Snellville GA) ran a 22:19 5K a few weeks ago so he is ready to roll. J.L. Seymore (Somerset NJ) ran a 21:16 5K in January but I find no results since March so his current fitness is in doubt. Morris Williams (Highlands NC) ran a 6:46 at the USATF 1 Mile Road Race to take 4th in this group but that's the only entry I can find. Nowicki would be a good bet but his recent 5K's have been above 25 minutes so I fear he had at least a minor setback this year. For my money it looks like: Goodhue, Frisby and with a roll of the dice, Williams. 75-79. In 2014 John Elliott (NY, NY) took this group by a full minute in 23:32. He was entered this year but family responsibilities related to Hurricane Joaquin are keeping him away. The next 3 were James Leitz, Wade Stockman, and Tim Kahn in times ranging from 24:45 to over 27 minutes. But none of them are entered this year. Roland Cormier (Jackson NJ) ran 23:01 last year in the M70 group. With Elliott out, he looks to be the strong favorite. Matt Lalumia (Clifton NJ) has several sub-27 minute 5K's to his credit this year, including a 26:40 on September 7th. Ron Mastin (Woodstock GA) ran a 24:59 5K in February and then a 51:51 10K at the Peachtree 10K Classic. Looks like in Elliott's absence it will be: Cormier, Mastin and Lalumia. 80-84. In 2014 John Harper (Seal Beach CA) took the gold in 26:38 and Fritz Schlereth (Syracuse NY) finished just off the podium in 4th in 32:47. This year they are joined by Wade Stockman (Rensselaer NY) who ran a 29:13 5K in June and a 29:34 a month ago. My pics: Harper, Stockman and Schlereth. 85+. Willis Moses (Vestal NY) who won last year in 34:17 has the category all to himself again this year. He is likely to be our oldest gold medalist.